Thoughts and Discussion of a young Catholic Church Musician dedicated to the Reform of the Reform, the spread of the Extraordinary Form, and living a life of holiness. Today, I will be blessed to attend a solemn vespers, profession of vows, and solemn high mass at the parish of St. John Cantius. The feast has layered meaning for them, as their brothers make professions of varying degrees, and it is also the 10th anniversary of the founding of the Canons Regular of St. John Cantius. It is also Fr. Phillips' 20th anniversary of being at this parish! I do not get to sing in the solemn high mass for this, but I will still very much enjoy internally participating in the music from the pews. I wanted to share the rundown of the music that will be done tonight. I hope to talk to the director after mass, who said he would be interested in auditioning me for the St. Cecilia choir, which is the one that will be singing tonight. There are even recordings of them for sale on the cantius website. Oh, I could have met you! I am just so pleased, so hopeful for the Church in our time when I look at what Fr Phillips has accomplished there. Hope your audition goes well, as well as your discernment regarding where you are going. My future as a church musician? 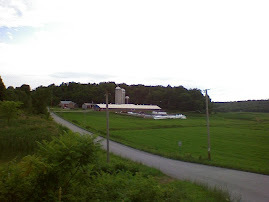 I grew up on a dairy farm in Highgate, Vermont so i'll always love the country. I graduated from college in May 2008, moved to Chicago for a year, and now live in Fort Worth TX as of June 2009. I want to join in the reforming of Catholic music and liturgy, as well as encourage a greater use of the Extraordinary Form of the mass. I am striving to follow God's will despite the immensity of my weaknesses and faults, trusting in the Lord's mercy and the guidance of the Blessed Mother. Save the Liturgy, Save the World!